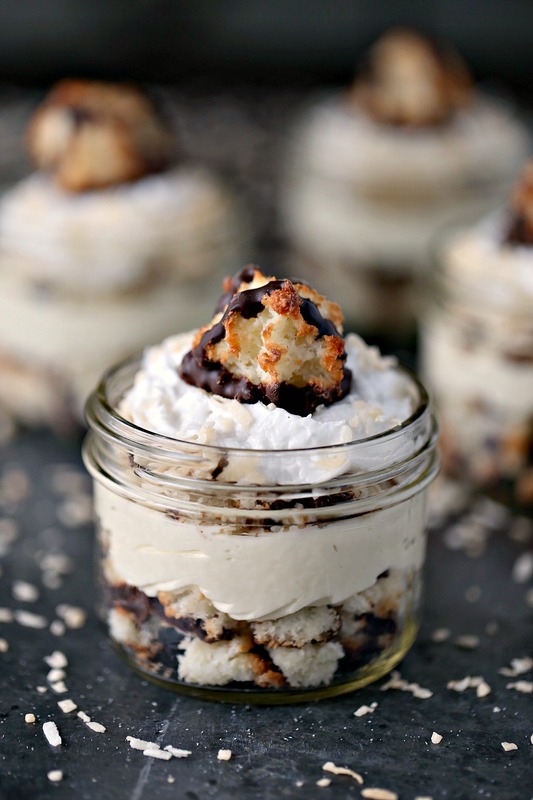 Layers of coconut macaroons, coconut cheesecake filling, toasted coconut, and coconut whipped cream. 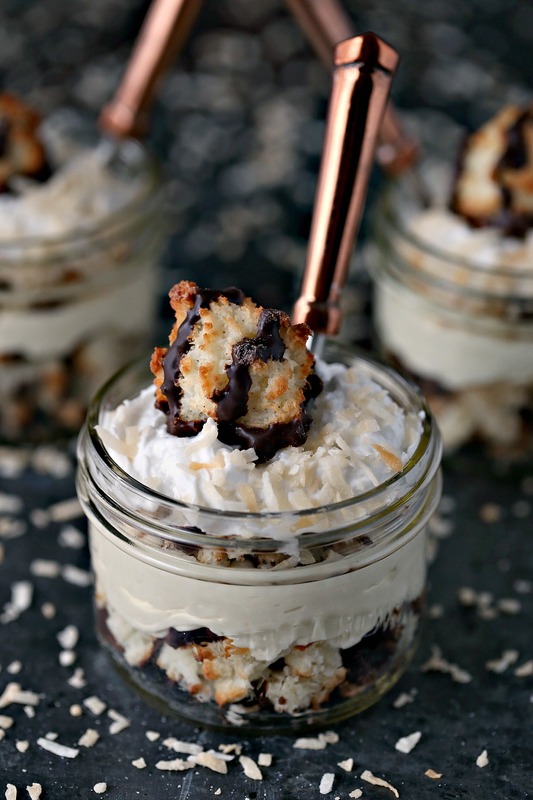 All topped off with a coconut macaroon cookie! 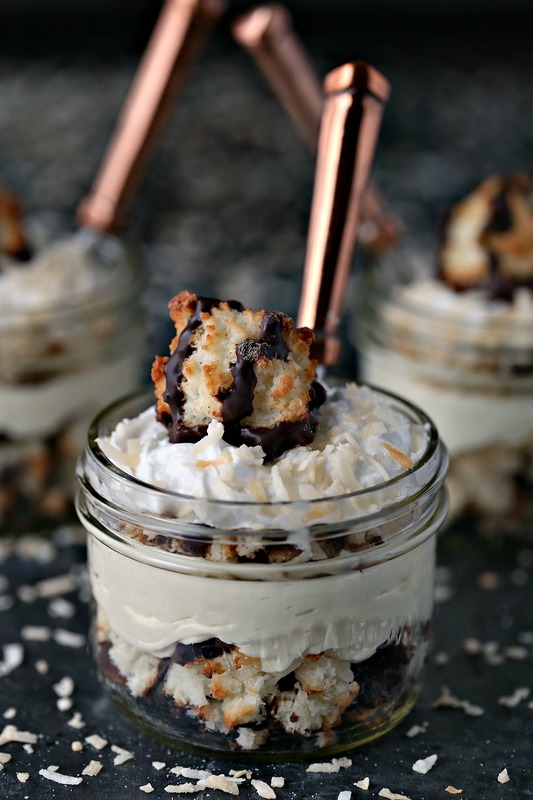 Click here to PIN these No Bake Coconut Macaroon Cheesecake Parfaits! This is a sponsored post for Gay Lea! As one of their brand ambassadors, I’ll be developing recipes every month featuring their products. All opinions are my own. Thanks to all the companies, and readers, who help support Cravings of a Lunatic. Long time, no post. For those who weren’t aware, I took a spill down some stairs about 6 weeks ago and fractured my leg. Needless to say, I’ve been off my feet for most of that time. I’ve spent about 4 weeks recovering and resting up. The odd time I feel strong enough to head into the kitchen to cook, or bake, I make super quick and easy recipes. I figure picking your battles during serious injuries is always the best approach to healing. We’ve ordered out a lot, I’m not going to lie. Those rare occasions when I had a burst of energy I fell back to my love of quick and easy recipes. I’ve always been a fan of simple and accessible recipes. During my recovery, those recipes were a necessity. I wanted to get in and out, quickly and painlessly. Easy recipes are perfect for the holiday season. I would rather spend my time with my family than being stuck in the kitchen endlessly during the holidays. Recipes like this one free up time to do other things. Things like watching Elf for the 100th time. 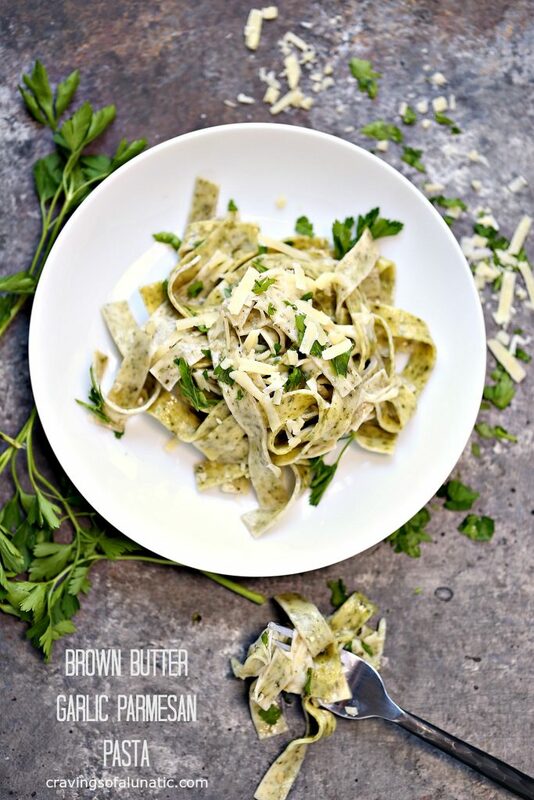 What I love about this recipe is it’s easy to whip together super fast. During the holidays we all have friends and family who pop in without warning. This is something you can put together in just a few minutes while your guests stare at your Christmas tree. During the holiday season, I always make sure I keep things like cookies, whipped cream, and cream cheese on hand. That way I can make a cheesecake parfait on the fly without a trip to the store. You can even toss in fruit if you like. Blueberries would go nicely in this dessert, as would raspberries. You could add cherry pie filling. Or even add in some jam or preserves. The possibilities are endless. You can keep it classic or go absolutely nuts jazzing this up. 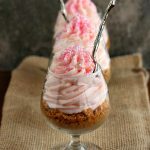 I used Gay Lea Real Coconut Whipped Cream in this recipe. They have a limited edition Dark Chocolate Caramel on shelves right now. Since I was laid up with a leg injury I could not scope out stores for that one. It’s tricky to find but worth it if you can. 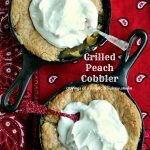 This easy dessert will be a hit with your family and friends this holiday season. I highly suggest making it for those special people in your life. You can make the coconut macaroons from scratch or buy them. No judgment here. Chop up 12 of coconut macaroon cookies into small pieces. Toss two-thirds of the chopped coconut macaroons in the bottom of 4 serving dishes. Set the one-third aside. In a mixer combine cream cheese, confectioners' sugar and 2 cups of the coconut whipped cream. Turn mixer on low, then gradually increase to high until the mixture is creamy and smooth. Scoop or pipe into serving dishes over top of the chopped macaroons. Toss remaining chopped coconut macaroons over top of the cream cheese filling. Toss half of the toasted coconut over top. Use more Gay Lea Real Coconut Whipped Cream to garnish the top. Toss remaining half of the toasted coconut over top of the whipped cream. 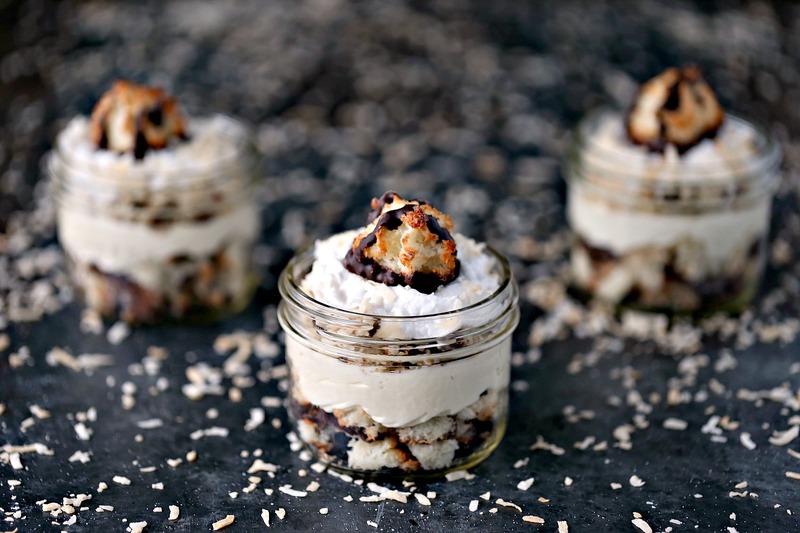 Top each parfait with one cookie. Refrigerate for a minimum of 30 minutes, or up to 4 hours. If making ahead of time wait to garnish with the 4 coconut macaroon cookies on top until you're ready to serve. Serve with a big old coconut loving smile! Best coconut cheesecake in the world! No lie! Use Gay Lea Real Coconut Whipped Cream. Be sure to check out #bornonthefarm on Twitter to see more great recipes! Gay Lea is celebrating this holiday season by counting down to Christmas Day with delicious cookie recipes. You can swing by their page to enter for your chance to win during the 24 Days of Cookies. PIN THIS TO YOUR FAVOURITE HOLIDAY OR CHEESECAKE BOARD! In case you missed my first recipe for Gay Lea, be sure to check out my Brown Butter Garlic Parmesan Pasta, pictured below. It’s super quick and easy to make. The recipe takes less than 20 minutes from start to finish. 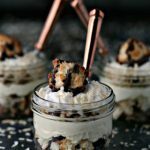 Swing by my recipe index for more no bake recipes and parfait recipes. You can also check out my Christmas recipes for all your holiday cooking and baking needs. Oh boy, what a joy ! Thank you for sharing and have a pleasant day ! OH my goodness, you poor thing Kim! I am glad you are returning to yourself and THIS is a great dessert to make when not 100%. PS. No shame in take out! Ah! I don’t know what excites me more coconut whipped cream!!! 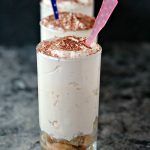 Or these parfaits. LOVE!!!! Pinning! I hope you’ll be back to your normal feeling self soon! I know it’s been rough but I’m glad you’re doing quick easy recipes so you don’t over do yourself. But let me tell you, this parfait is amazing! Dude. I would put that coconut whipped cream on everything! Every. Dang. Thing. I’m with you around the holidays–any dessert recipe that gets me eating something sweet and back on the couch and watching elf with my family is a winner. I’m happy to hear that you are getting around a bit more easily now. Silly puppy! Whoa!! These look so yummy! I’ll h ave to keep a look out for that coconut whipped cream in the stores. It sounds amazing! 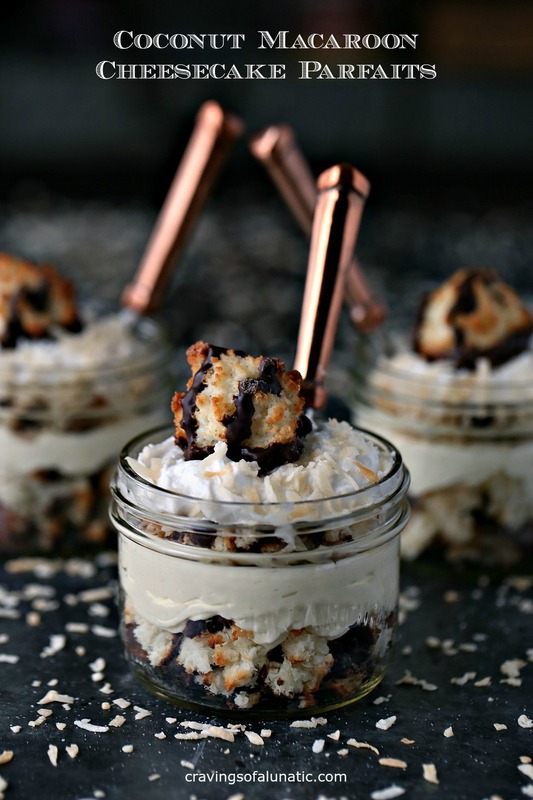 Macaroons are SO good on their own, I can only image how epic these parfaits taste! I could go for a few now! 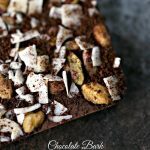 I am pinning this one and going to try these delicious treats! First of all, I love this dessert! Second of all, I’m so psyched to know that coconut whipped cream comes in a can, I had no idea! Visiting from What’s Cookin’ Wednesday. I’ve never heard of coconut whipped cream, of course, I’ve never looked for it but now I will. 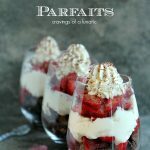 Your parfaits look fantastic! I’m ready to dig in!! I have never seen coconut whipped cream in our are. Could you use coolwhip and add coconut flavoring and some flake coconut. The only stores we have are Meijers and Krogers. You could try adding coconut extract to cool whip but it could change the texture a bit. I’ve not tried it myself. I have added flaked coconut to it though. Often. Our make your own whipped cream. Put you mixing bowl and whisk/beaters in the freezer for 15 to 30 minutes. Add all the ingredients to a cold mixing bowl and mix on high until peaks form. If you use a hand mixer you would use beaters or the whisk attachment if it comes with it. Some do but some don’t. If you use a stand mixer you would use the whisk attachment.